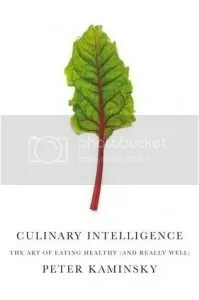 Photo of the “Culinary Intelligence” book jacket via Politics of the Plate blog. “In the mid-1990s, Peter Kaminsky, a self-proclaimed hedonist, landed the perfect gig. As the writer behind New York magazine’s “Underground Gourmet” column, he was paid to patrol the outer reaches of the boroughs in search of the tastiest ethnic fare. When he wasn’t sampling Vietnamese, Korean, Greek, Cuban, or West Indian cuisine, his duty was to discover little-known, up-and-coming restaurants. And as the magazine’s go-to food writer, Kaminsky was also called upon whenever the likes of Daniel Boulud, Alain Ducasse, or Thomas Keller opened a new bastion of four-star-fare. Some of New York’s greatest chefs hired him as a co-writer (and taster-in-chief) for their cookbooks. And mend he did, shedding 40 pounds, getting his blood sugar levels under control, and regaining his insurance policy. Culinary Intelligence is the story of how he accomplished what many dieticians say is impossible: losing weight and keeping it off. Read more on Politics of the Plate. I lost 22 lbs in nine months by simply replacing vegetable oil, also known as pollyunsaturated oils with virgin coconut oil. Three to four tablespoons a day will do it.The more you eat the more you loose weight.The first 2 months I lost 12 lbs and the next 10 lbs I lost within the next 6 to 7 months.I’m not on a diet.I just replaced one oil for another. Try it.